One of our special trees is this Holm Oak (Quercus ilex). 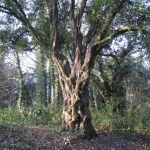 The superb natural sculptured trunk of this fascinating tree is well worth seeing. It is located adjacent to the driveway that leads to the Rangers Office. Although this species of oak was originally from the Mediterranean area it is remarkably tough and unlike our native oaks it keeps its rather prickly leaves throughout the winter (as can be seen in the picture). 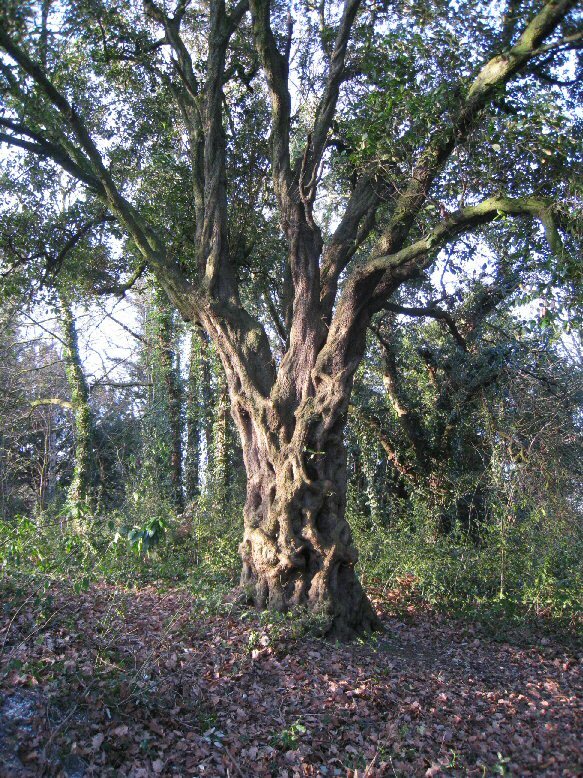 The’ ilex’ in the scientific name refers to the holly like leaves and this tree is sometimes also called a Holly Oak. Wild Flowers – This year may have been exceptional but there have been some flowers in bloom throughout the whole year ‘snowdrop-to-snowdrop’. Come ,find them and enjoy. 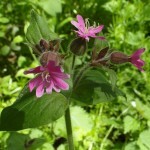 Here is a Red Campion (Silene dioica) which flowers from March to October and is quite abundant in the reserve. 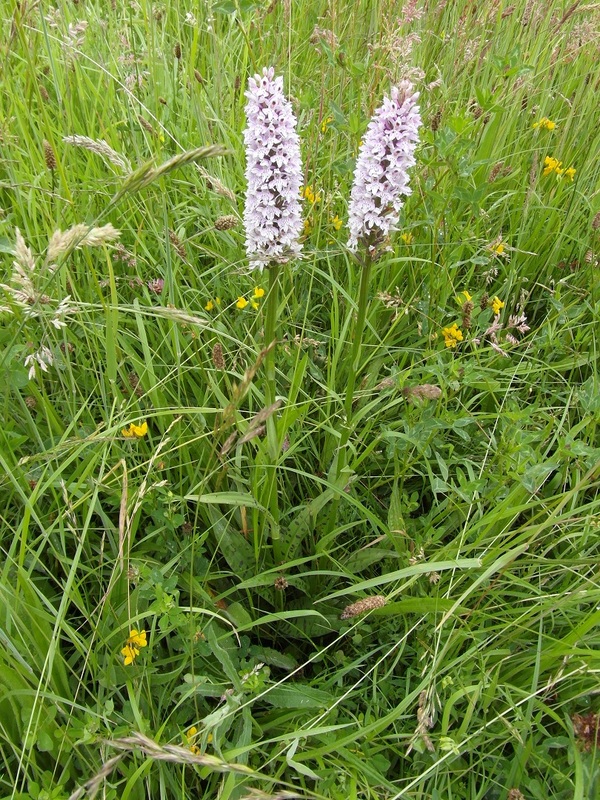 We are also pleased to say that we have a few Common Spotted Orchids Dactylorhiza fuchsii growing in the reserve. Note the spotted leaves that give the species its name. 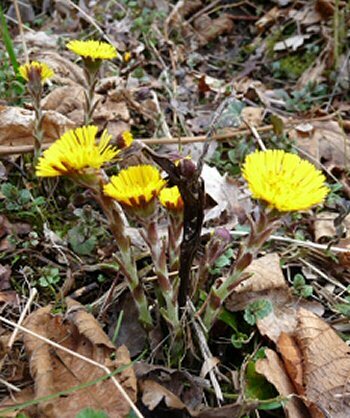 COLTSFOOT (Tussilago farfara) This plant produces flowers before it grows its leaves. 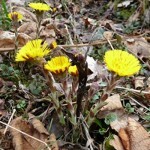 It has bright yellow, frilly flowers about 2-3 cm across. 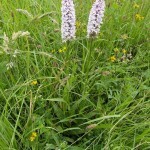 The plant gets its English name from the leaves which are the approximate shape and size of a small horses hoof. It is a member of the daisy family. 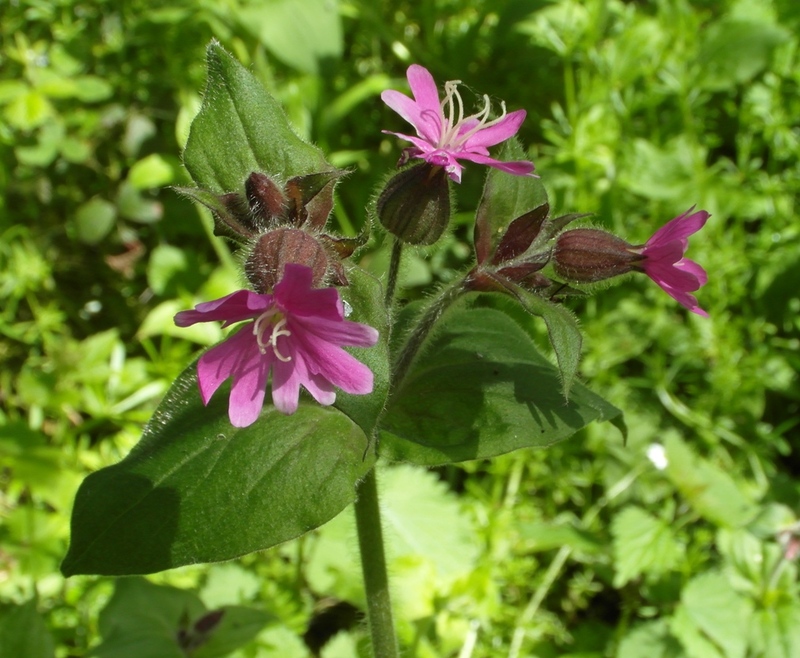 It has long been used to treat coughs and chest complaints – the ‘tussis’ in its name is latin for cough. Ferns, Horsetails and Mosses – lots of different species in the reserve including Giant Horsetail, Field Horsetail, Hard Fern, Polypody, Hart’sTongue Fern, Lady Fern, Male Fern, Scaly Male Fern, Broad Buckler Fern and Hard Shield Fern, not forgetting Bracken. No doubt there are also lots of other species so do come along and see what you can spot! (and please let us know what you find ). 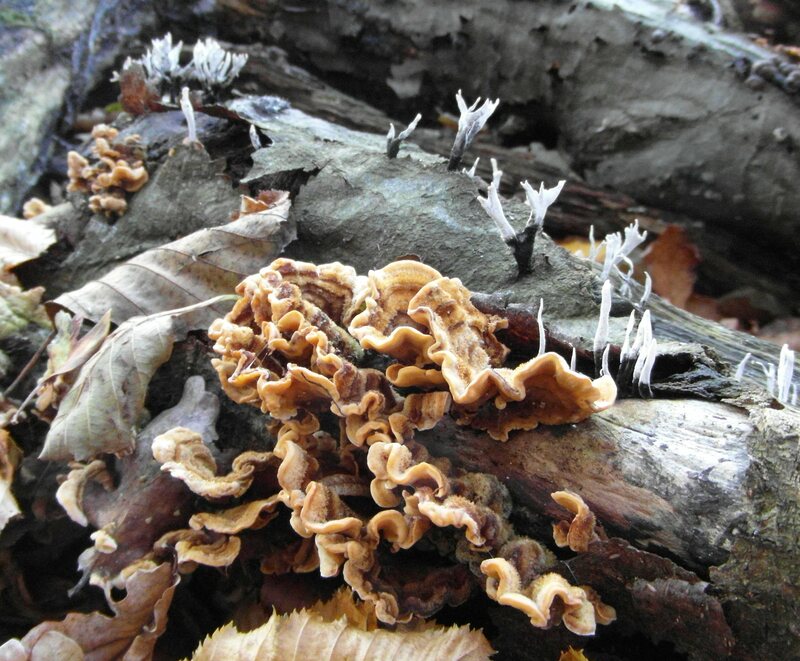 Fungi and Lichens – the ‘dark arts’ of the plant world. Lots of them, fascinating and often beautiful. See the Scarlet Elf Cap on the Wildlife page, and the Dryads Saddle, Polyporus squamosus, that features in one of our page headers. Here are several that have been found here. This is Chicken of the Woods, Laertiporus sulphureus. 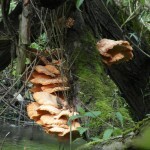 It is also sometimes called Sulphur Polypore. Here it is growing on a willow. It will destroy the heartwood of the tree and eventually kill it. 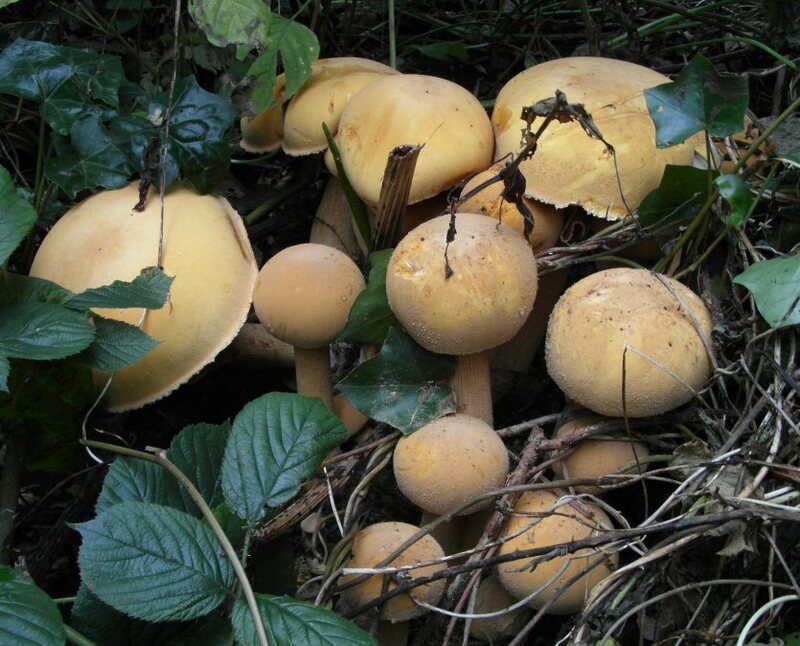 Some consider it edible at certain stages of growth but others report that it is likely to cause stomach upsets – so please don’t attempt to pick or eat it. 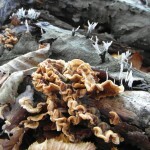 Here are more species of fungus to be found in the reserve. The one with white tips is Candle Snuff Fungus or Stag’s Horn Xylaria hypoxylon. Very common growing on dead wood. The brown bracket-like one is probably Trametes versicolor also very common on dead wood. 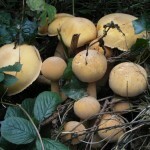 Gymnopilus junonius or Gymnopilus spectabilis. Commonly known as laughing gym, laughing Jim, or the Spectacular Rustgill. 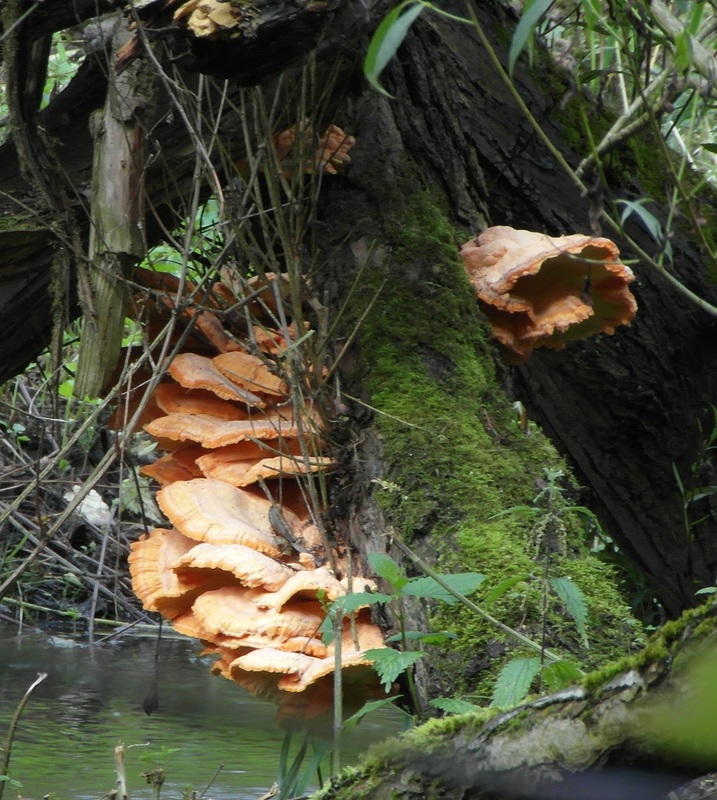 This large orange mushroom is typically found growing on tree stumps, logs, or tree bases. As they age they become a brighter orange and being up to 15cm across provide a spectacular display. Can be seen close to the Rangers Office (during mid October). They do contain cyanide and are poisonous! 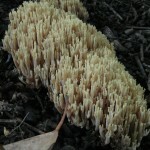 Ramaria stricta known as Upright Coral Fungus. 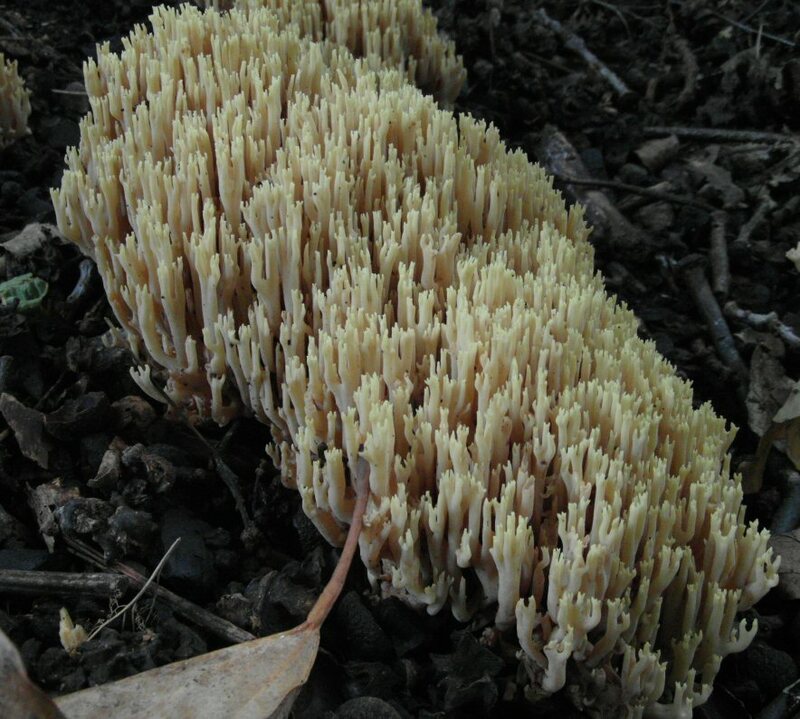 This fascinating fungus produces clusters of upright ‘stems’ , This cluster is about 15cm across. (photo taken mid October). It grows on decaying wood and apparently has an unusual smell.